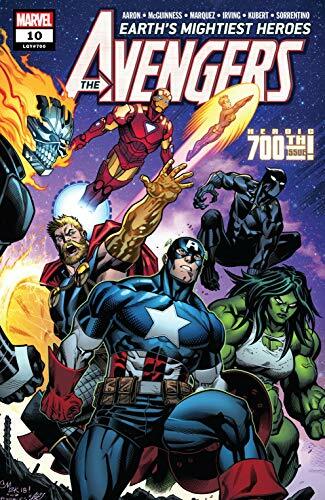 Written by Jason Aaron, David Marquez, and Ed McGuinness with artwork by Frazer Irving, Adam Kubert, and Andrew Sorrentino, issue 10 of the new Marvel Comics series The Avengers, and it also happens to be the 700th issue. 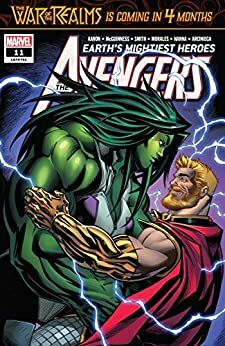 The story picks up where issue 9 left off, the Avengers are battling Namor and his ocean “Defenders.” However, they face a new threat as the Winter Guard is reformed with the Red Widow, Crimson Dynamo, Darkstar, Vangard, and the giant Ursa Major, a talking bear with an anger problem. This forces new Avengers chairman Black Panther to try to develop a new apparatus for the Avengers, including recruiting the Wasp and Blade into the fold so they can pick up where SHIELD left off. Meanwhile, General Ross and Agent Coulson have recruited the Squadron Supreme now that the Avengers refuse to take orders from the US government. Issue 11 is written by Jason Aaron, Cory Smith, and Ed McGuinness with artwork by Mark Morales, Scott Hanna, and Karl Kesel. Black Panther continues to attempt to develop alliance, including with characters like Captain Britain. Meanwhile, we see Agent Coulson viciously kill a person he thinks is a spy from the Avengers. Also, Thor and She-Hulk have a date in the Savage Land. While I like the first 9 issues of the new series, I am not pleased with these others. While I am not opposed to some small government-type stories, these two are portraying the Avengers as being openly disdainful of the United States, looking to the fictional Wakanda as a beacon. It is a shame that the Avengers are turning a complex character like T’Challa and turning him into a Mary Sue who can do no wrong. Let’s hope that these annoying trends do not stay. Also, I am not digging the bulked version of She-Hulk. She was meant to represent strength and beauty, but now she is all rage and just a gimmick version of her cousin the Hulk. That is disappointing as a long-time fan of the series. What do you think? Let me know in the comments below. Tell me if there is a comic book, movie, or novel you would like me to review. While you are at it, read my Top 5 Captain America costumes and Dragon Ball Super: Broly. Don’t forget to like, share, and subscribe for more posts like this one.